Step one: Keep your vision in your mind’s eye, the thing you want so much that you can endure the fear of it. If you’re not sure what your vision is, head to Chapter 4 of Smart Girls Screw Up Too and let’s get you started on figuring this out. Step two: Be grateful for the fact that you are in a position to be offered whatever opportunity it is that is making you doubt yourself. You earned the right to feel like an imposter, and this is to be REALLY celebrated. If you’re not feeling imposter syndrome, you’re not living a Fully Expressed life. Step three: Be kind to yourself. 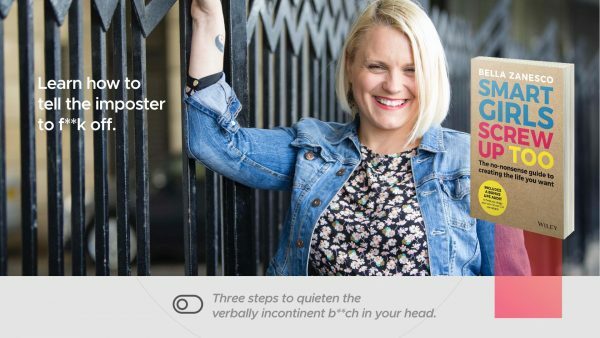 For every mean comment the verbally incontinent b**ch makes, you need to tell yourself three positive things or if you can’t do that, phone a friend and have them do it for you.